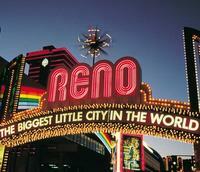 Poor or lucky, Reno is what it is, which is primarily a city of casinos. That means lots of large rooms with gaming tables where you never can tell what time of day it is. That means hotels that are both elegant and tacky. That means multiple buffet dining options with food that is high in calories and sometimes even edible. That means the same kind of debauchery that you’ll find in Las Vegas and other gambling cities, and if you need me to describe this debauchery you probably shouldn’t go to Reno. In addition to all that, Reno offers a chance to appreciate nature in between spins of the roulette wheel. It is only a short drive from Lake Tahoe and all her splendors so if you get tired of the gambling scene you can get a reprieve across the California border. Maybe we should start calling Reno an eco-groovy man’s Las Vegas.